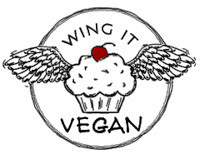 Wing It Vegan: Road Buffoonery, Self-Confident Patties, and a Berry-Eating Contest! Road Buffoonery, Self-Confident Patties, and a Berry-Eating Contest! The lights are already out. Mr. Wing-it sleeps peacefully next to me. I'm trying to catch up on my blog reading until my eyes burn. My eyes burn, so I decide to go to sleep. Ever so gently and quiet as a mouse, I move the laptop from my lap to the ridiculously minuscule night table. The laptop pushes the alarm clock/radio OFF said ridiculously minuscule night table, and the alarm clock/radio lands on the floor in a small gap between the night table and the wall. The radio turns itself on and starts blasting a Lady Gaga song from down there. I, a weird germaphobe who wears slippers in hotel rooms because I don't even want my socks to make contact with the floor, reach behind the night table in the dark trying to find the stupid radio, frantically feeling my way around the floor with my bare hand. Mr. Wing-it wakes up in a serious state of grogginess and confusion: "What's going on?". I promptly emerge from my expedition to explain the situation and I WHACK my head on the wall-mounted lamp above the table while Lady Gaga keeps blasting in the background. There was nothing left to do but laugh! That was one well lit hotel room wasn't it? That was nice for a change! These are my Saucepan Peanut Swirl Brownies that I made in Madison, Wisconsin. Our hotel room had a stove top and I had a saucepan, so that worked out. Recipe coming in a couple of weeks along with some other saucepan/frying pan "baked" goods. 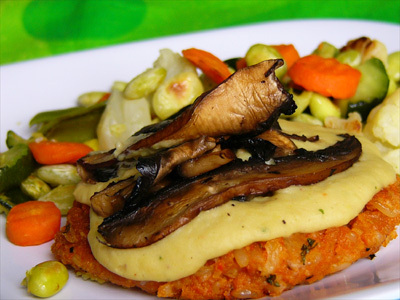 Next up are some yummy rice patties topped with white bean sauce and mushrooms. I love these rice patties because they know exactly who they are: rice with veggies shaped into patties. They don't go about life pretending to be a faux meat, flaunting their vital wheat gluten and calling themselves something they're not. That's self esteem. Must be nice! This a formula more than it is a recipe. It's a great way to use up leftover rice and turn it into something different. Just sauté whatever veggies you have in the refrigerator, or add some chunky salsa instead if you don't feel like chopping and sautéing. Throw in whatever you have that needs to be used up before it starts growing fur. Know what I mean? 1- Whisk together the vegetable broth, tomato sauce, salt, parsley, and your other herbs and/or spices. 3-Stir the broth mix and the sautéed veggies or salsa or whatever goodies you want into the cooked brown rice. 4- Stir in the breadcrumbs and oats. If the rice mix is too soggy add more breadcrumbs or ground oats, if it's too dry add more broth. It shouldn't be too dry or it will be all crumbly and hard to eat. I can tell you this after making a dry batch and having to chase pieces of patty with a fork around the plate. 5- Preheat a frying pan with the olive oil over medium heat. 6- Take chunks of the rice mix and shape them into patties. I make 5 medium sized patties, but you can make a lot of little ones as well. 7- Cook the patties until the bottoms are nice and golden brown, flip and cook for a couple more minutes or until the bottoms are golden brown. Enjoy with roasted veggies or a veggie stir-fry! The Quick White Bean Sauce of awesomeness comes from lovely Diann. If you don't know who Diann is, then remove yourself from under that rock and check out her amazing blog! You'd be missing out on some delicious AND nutritious goodness if you don't. Hwy I-44, Bois D'Arc, Missouri. not even one single vegan cupcake taking over Bois D'Arc. Here is some adorable birdie cuteness from our stay in Madison. These little Waxwing Birds were eating berries from a tree right outside our window. They were swallowing them whole and just shoving them down like they were on a berry-eating contest. The thing is that it started to snow and the berries froze, so some of them got stuck to their little tongues! They kept shaking their little heads trying to get them off! Poor things! The berries ended up thawing out in their beaks after a few seconds and they were able to eat them, so don't worry - nobody choked to death. "Stop taking my picture and give me the Heimlich maneuver, you big idiot!" Poor Mr. Robin was trying to eat berries too, but he wasn't very good at it. He was probably able to eat 1 out of 10 out of all the berries that he picked. They kept falling right out of his little beak! He looks so frosty there. Doesn't it make you want to grab him and warm him up in your hands? Before we say our goodbyes there's something I need to ask you all vegan cookbook connoisseurs. What non-obvious cookbooks can you recommend? I'm collecting cookbooks and after I have all the most popular ones (Veganomicon, Eat Drink & Be Vegan, Vegan With a Vengeance, etc) I will move on to the lesser-known ones. Please enlighten this humble disciple with your invaluable wisdom. Happy Easter and Passover to everyone who celebrates! Too hilarious about the Lady Gaga song blasting!! HELL YES FOR SOY-FREE RICE PATTIES!!!!! Haha, fun road sign :-DGorgeous birds!! You made those in a hotel room?! You're my hero! Awesome hotel fare once again! You're amazing!! Even if you have Curly moments ;-) One of my favorite unknown cookbooks of all time is Vegan Cooking (http://www.beegreen.com.au/products.asp?id=154). Oh the brownies! I love the pictures of the birds! The poor little frozen birdies! I couldn't stop laughing after I read your story. (Don't worry, stuff like that happens to me a lot too)Your brownies look great, I am impressed that you made those on a stovetop. Can't wait for the recipe! Those brownies sound delectable!!! Can't wait for the recipe. The bird pictures are STUNNING! haha that is a great funny story! glad to see you're making such DELICIOUS things in a hotel room! quite impressive..
and i am totally drooling over those brownies..
Ouch, that alarm clock incident sounds painful! And those brownies? Those brownies! And the birds? You take amazing bird pictures--something that's not so easy to do. I'm uber envious of your talent! OK, you're a photographer for the Audubon Society? I am in awe of the goodness you make on the road. Hopefully the brownies make up for the bumps and mishaps in the night! Lost in Austen is on the way! I can't wait! I'm visiting my mom next week and I know she'll love it. The brownies aren't too shabby either! Your story about the alarm clock totally sounds like something I would do *sigh*. Glad you found the humor in it though, haha. I am always amazed by the fantastic eats you can create in a hotel room! Those brownies--whoa. And I'm going to try out those rice patties! I wouldn't think you're clumsy--it IS really dark in those hotel rooms. And even though those birdies looked a bit distressed, I had to laugh at the Heimlich maneuver! i'm glad you're excited about the coconut milk! i can't wait until i get home for summer break and can buy some from whole foods! as for non-obvious cookbooks, peanut butter planet! ( i blogged about it like a month ago) it's by the same person who wrote vegan planet..
also, i haven't gotten a chance to really use this book, but just from flipping through it, vegan world fusion cuisine is awesome! and aesthetically it's a beautiful cookbook w great pictures and inspirational quotes--it's kind of like, "around the world" vegan style. it has lots of raw/living recipes, including a lavender infused carrot soup i can't wait to try! and it's all super healthy. also, i know this isn't obscure, but do you have JOVB? bc that's a MUST!! oh, and if you could maybe hold out a little, isa's Vegan Brunch cookbook comes out May 25 i wanna say, which i'm convinced will be the best cookbook EVER from looking at preview photos on her blog. also, colleen (author of JOVB) has a reg cookbook coming out called the vegan table! I just love your posts, River - just want to have you over for tea and giggles or something! I drove across the US (Western Arizona to Northern MI/Canada) a few times, and did lots of hotel stops - If I didn't have a big nightlight with me I would have broken my nose! The rice patties look super cool and I love that they aren't full of everything (whole foods! ), I agree, Diann is the bomb, and I love all those birdie pictures! I guess I'll stop now! We, at the http://liftyouup.blogspot.com, found that your blog full of excitements and fun. Great story to share about. In return, we hope you pay us a visit so that we can enlighten you with our story. you cook up the best looking meals in your hotel rooms! Those brownies look fudgilicious. And I always enjoy your wildlife shots. As for cookbooks, you might like Real Food Daily or Vegan Planet. Are you interested in a particular cuisine? Because there's also The Asian Vegan Kitchen and Real Vegetarian Thai if you like that kind of thing. I haven't cooked many dishes from the latter 2 but they come recommended from others who have. awesome post! i cannot believe you made those amazing brownies in a saucepan! i can't wait for the recipe! great burger too...i have had some trouble making them so i will have to try your recipe. Your hotel cooking and photographing skills are really amazing! Oh, and is there a recipe to these brownies? Please? They look fantastic. You are amazing, River! Seriously. I can't believe all that gorgeous food was concocted in your HOTEL ROOM! The birdie pics are great too! As for cookbooks, I'm really loving Ani's Raw, Vegan Soul Kitchen, Vegan Fusion, and Don't Feed the Bears (that's more of a cookzine, but I think you can get it on Amazon). I can't decide which is more amazing--Your ability to bake brownies in a hotel room or your astonishing nature photography! A cookbook I really love is "Eat Your Veggies" by Beverly Lynn Bennett (it's actually an e-cookbook that I bought from her website" vegan chef"). She has some really fantastic recipes! I always get so excited when I see you have posted! Also, your hotel eats look freaken amazing! LOVE the Confident Rice Patties.. I really like the Blossoming Lotus cookbook. It's all photos of food, beautiful places and words, as well as the recipes. I honestly haven't cooked much from it, though. The bird photos are beautiful! And your brownies look decadent! As for cookbooks, of which I have far too many, I hope you have all of Dreena's and Isa's books. And the Nava's Vegan Soups and Stews is great. I also recommend V Cuisine and The Complete Vegan Kitchen. Two I use to *wing it* are Simply Vegan and 150 Vegan Favorites. Two I have never used are Native Foods (too much faux meat and tofu) and Everyday Vegan (not Dreena's). Now I'm looking forward to that brownie recipe! OMG those rice patties look excellent! I can't believe you can manage to cook in a hotel room- laziness aside, i think i'd find it tough to cart around the groceries. But it all looks fab, and I agree- can;t wait for the brownie recipe! I can't believe the food you can make in hotel rooms! That must make being on the road so much easier...speaking of the road, I love the PPK exit sign - too bad Isa and Terry weren't waiting off the interstate. Definitely trying those brown rice patties - they look so much more colorful and tasty than many veggie burger/patties - they deserve to be so self-confident. The closeup bird pictures are beautiful too! I've been watching the early arrival of robins here, and I'm sure they wish they'd waited down south another week or so. 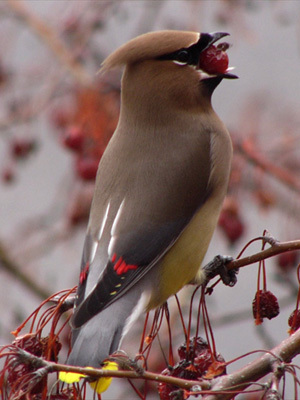 The bird trying to put away those giant berries is too much. Great post, and I'm looking forward to more road food! I suggest any cookbook by Bryanna Clark Grogan. Saucepan peanut swirl brownies?!?! Ahhh! I cannot wait for the recipe! You are so creative and resourceful! Oh, and I totally am a germophobe too and freak out when I have to be barefoot in certain locations...Bedroom slippers are my BFF. Your brown rice patties recipe formula is going to be super useful in the future, so thank you thank you thank you! I have it bookmarked now! I don't have any obscure cookbook recommendations. ED&BV, VwaV, and Veganomicon are the holy trinity as far as I'm concerned and no other cookbook is necessary. I do enjoy Ani's Raw Food Kitchen to switch things up every once in a while, though. Oh, and YES!!! Try Nana's No Wheat Choc Chip Cookies as soon as possible! those brownies look moist and chocolately!!! 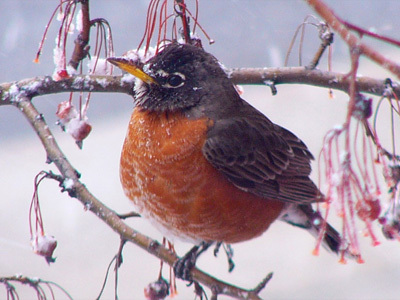 the birds are too adorable, especially the cold one, i just want to tuck him in my sweater! AWWWW Miss Confident Rivvy Berry!!! I looooooooooove your post and it brightens up my day!!! You are the coolest! Everyone loves you...I love you...the birds and the rice patties loves you!!! Woman you are amazing!!! I bow down to you chef rivvy! Please take me with you!!! I know I will be so well-fed! SRSLY! Can't wait for the next post babe! lubbbbbb ya to the core! you just made my monday with your post, River! yay! glad to *see* ya again! superw00t! your hotel room scenario sounds like something i could totally see myself being in. dan is always telling me i'm not much of a "smooth operator". ahahahahahaaa! 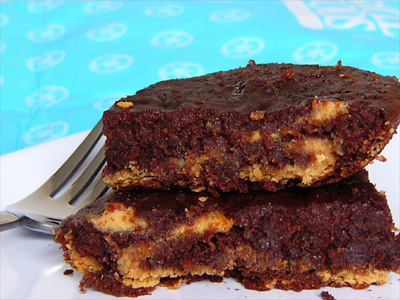 i think your saucepan peanut swirl brownies look ever-so tasty! i cannot wait for your recipe, River! dan and i still can't stop making your stove top muffinish goodies these days. mmmmmmmm! and i love the idea for the rice patties! totally gonna have to give them a whirl! thanks for the recipe! they look deeeeelicious! gonna have to try out Diann's white bean sauce when we get some more bulk white beans soon! i've seen it around and it sounds too good to be true! those poor little birds with frozen berries stuck to their tongues. the robin looks a little sadface, fo 'sho! poor little things! the PPK sign made me smile! yay! i love the PPK boards - they're too fun! as for cookbooks - i love Yellow Rose Recipes & Vegan Planet A LOT! they're two of our favorites, fo 'sho! i also here that Vegan Soul Kitchen (it came out just a little while ago) is pretty rock'n, too - although i haven't tried it. 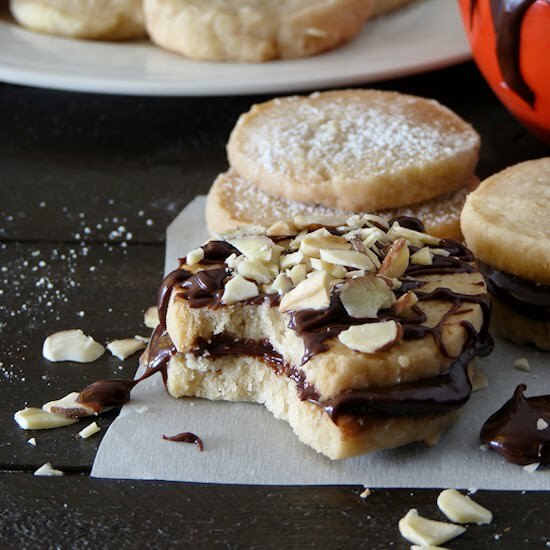 we also have the Joy Of Vegan Baking, but have only tried a few recipes from it - it's pretty awesome as well! love the ppk sign and the birdie pics! as for cookbooks... i really like accidental vegan. simple recipes that are mostly very tasty and easily tweaked. i'm also ordering the vegan soups and stews for all seasons book because i've heard nothing but great reviews of that so far. i'll let you know how it is once i get it, if you like! LoL to your story but I hope there aren't any repeats!! Your food looks wonderful! I can't wait to try the patties. Oh, I laughed so hard at your buffoonery story. You're so funny. Hope you had a happy bunny day! Your posts never fail to make me chuckle!! I love the lady gaga story - totally sounds like something I would do too, I'm so clumsy! I can't believe you made those brownies in a saucepan!! you are a genius. They look amazing. I love the self confident patties too - I'm now wishing I had some cooked rice in my fridge!! River, you are so inspiring! Wow--what you can cook up in a hotel room makes me want to get my lazy self into my fully equipped kitchen and try your recipes! Your birdie photos are amazing..I have trouble catching them here.always darting in and out of the trees but you did a great job. yay! Yummo looking brownies and rice patties, beats room service! And cute birdies, you take fantastic photos! I love that you cook things up in hotel rooms that are better than what many make at home! Those birdies are so cute, I hope the robin got enough to eat! the universal torture of a non familiar clock radio blasting when you don't want it to. of course, your rendition was more exciting than most. mmmm... pan brownies. only you could pull them off. Those birdie pics are very nice. It's very freaky that he would stuff himself w/ such a huge berry. Yay for Milwaukee! We lived there for two years and it was my favorite place that I ever lived. Of course you must wear slippers in the hotel room - you mean everyone doesn't do that? I would have been freaking about having to touch the carpet behind the table! I can't wait to try those rice patties - back in the day I used to make a cheese version. They look wonderful. A good book for your road trips (and at home) would be The Short Cut Vegetarian by Lorna Sass (it is vegan). All very easy and delicious. I like the new Vegan Express, by Nava Atlas a lot, too. Those bird pics are beautiful! I love birds. What a beautiful robin/ ceder wax wing! As my son would say 'I NEEEEEEED a chocolate brownie' and that swirly saucepan recipe looks just perfect! the late night fumbling in the dark totally sounds like me. But all klutziness aside I need those brownies! I love all those photos and am amazed you've been making so many goodies while on the road. I can completely relate to being clumsy in a new place like a hotel room! That is just WRONG! No one should be able to create such decadent peanut swirl brownies IN A HOTEL ROOM!! You rock! I always lose weight on trips where we stay in hotels because of the lack of food...but now you're gonna make me try these! shazaaamm! i really would ove a lexen!! I'd make macaroons for sure! this is such a wonderful post. im with you on loving "self confident" food that doesnt pretend to be meat! haha...just love it. those patties looks amazing. will def. try them. That bird with the berry in its mouth looks so cute! !